“Nordstrom has a waiting list for a Chanel sequined tweed coat with a $9,010 price. Neiman Marcus has sold out in almost every size of Christian Louboutin “Bianca” platform pumps, at $775 a pair. Mercedes-Benz said it sold more cars last month in the United States than it had in any July in five years,” according to last summer’s NY Times. A recession usually marks the decline of luxury good sales. Individuals spend less on unnecessary clothing, vehicles, and vacations to save more on immediate needs, like mortgages, credit card debt, food, and childcare. Yet, this generation’s recession has noticed a marked revival in sales of late, a good sign for luxury goods dealers. If high-end markets, forecasted to be last in line for recovery, are gaining ground, then why are markets for immediate need—such as legal aid or the job search industry—struggling so far behind? Economists believe it’s statistically simple to predict the fickle whims of consumers. And, for law, they’ll site oversupply of providers with under-demand for services as the reason behind a slump in the legal field. But, perhaps oversaturation of the market is not to blame. Is it possible that luxury industries have a secret economic tool, innovation, or know-how that’s missing or hidden from deeper-rooted corporations? It’s more likely that luxury industries—understanding the difference between essential and optional—embrace technology, specifically smart phones and mobile apps, not as luxury items at all; but, instead, as valuable and necessary retail, sales, and marketing norms. Tablets, e-devices, and other gadgetry are not news, they’re professional needs. As such, people around the world are searching job vacancies via LinkedIn, locating food delivery via the Seamless app, and finding friends through Meetup Groups and social media. Of course, computer programming allows any service to be customizable with the drop of a line of code. Ritz Carlton’s app is no exception. “Additionally, the app will offer personalized suggestions to guests based on location and duration of stay,” writes Melanie Nayer of Boston.com. What does all this mean for law firm management? Well, for research lab Potentialpark, it means law firms should start seriously considering mobile recruiting. By this time, law firms should have a web site, blog, and possibly even a mobile app to advertise its expertise and expert lawyers. Unfortunately for legal recruiters, however, a study by Potentialpark (via Mashable) discovered that while a healthy 19 percent of job seekers use their mobile devices for career-related purposes (and more than 50 percent could imagine doing so), only 7 percent of employers have a mobile version of their career website and only 3 percent have a mobile job app. So, your future legal recruits want to use their mobile phones to look for jobs, receive job alerts, check their job status, and get tips for the application process. And, although they can check-in to their flight on a smartphone to attend an interview, they can’t actually find your job openings mobile-y. 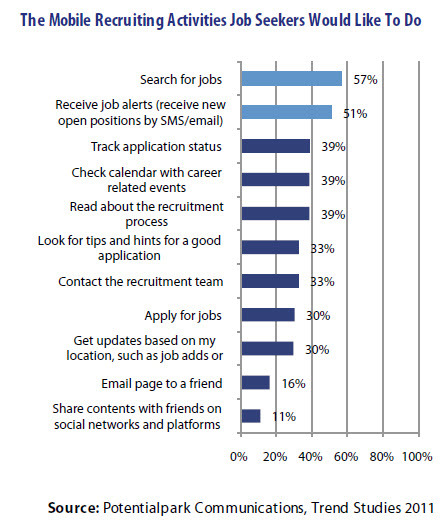 Right now, one in five job seekers makes use of their mobile phone to head hunt. In the future, these numbers will only increase; which is why hotels, like the Ritz-Carlton, have harnessed mobile recruiting power. But, the question is, why haven’t you? For more information about mobile recruiting and developing an online, anywhere, anytime talent sourcing strategy, attend The Center For Competitive Management’s audio course on May 22, 2012. Common terms defined including; mobile web, native apps, QR Codes, SMS and other mobile recruitment innovations. How social and mobile meld and how to leverage your current social presence for mobile recruitment. How GPS and location based services can help you create a more local mobile experience for prospective employees. Although your law firm manager may not be yelling over the internal comm-system, “Time is money, people!” certainly, he or she is thinking it. So why, exactly, does time equal money? In purely financial terms, there exists a time value of money. Money earns interest over time. So, the value of money actually changes—for example, if invested, $100, in one year, could turn into $105 future value at 5 percent interest. In addition, if a finite amount of money is spent to accomplish a certain task, the money is spent in place of a second, possible, alternative task. Would you rather spend $15 per hour for a paralegal to locate a physical document in the law library over 10 hours? Or, would it be more efficient and cost-effective to purchase e-document software at $150 that locates important paperwork in under 5 minutes? These are all questions with which financial consultants and law firm administrators struggle everyday. And, in the 21st Century, questions about the time value of money generally surround a tradeoff: investments in technology or in manpower. “When you’re efficient, you take on less risk – Simply put, the less time you spend on a contingency case, the less risk associated with taking it on. If you lose, you’re not sacrificing as much time or revenue. If you win, you’ll make the same amount of money, but since you spent less time on the case, your margins are higher. And, if you win or lose but don’t get paid, you’re out less money. When you’re efficient, you can take on more cases – If you can generate a Will twice as fast as your competitor, you can do twice the amount of work, right? When your process for settling civil disputes speeds up, you can twice as many disputes. In essence, the more time savings you experience, the more availability you have to generate revenue, and the more revenue you can generate. Apps for smartphones and the iPad have contributed some of the most significant improvements in efficiency and productivity within law firms recently. Get with your IT Department to brainstorm how best to implement this tool into your everyday legal activity. Read about some of the most valuable legal iPad apps here. From Google Wallet to Starbucks Mobile Payment App, NFC technology has myriad uses in law and billing arrangements. Make sure your firm is paid on-time by reading about applications for NFC technology here. Social media sites like LinkedIn or legal recruitment web-agenices, including lawcrossing.com, are cheap and easy ways to locate qualified candidates. It saves recruiters time and money by already compiling information about prospective employees. Even if your firm is not looking to hire, it’s certainly still looking to recruit clients. At which point, social media—blog posts, tweets, or Facebook feeds—become crucial in advertising what services your firm offers, who its lawyers are, and why a client should hire you, as opposed to another firm. In the time it took you to read this line, I sent a tweet, then 500 people read it. Talk about a brand new, instant value for time in money. Today, most law firms already use some sort of electronic discovery software. However, when did your firm last update it? The capabilities of software and technology change rapidly each day. Thus, if you can’t remember the last time your firm updated its online systems, chances are there exists a more efficient way to organize and file e-discovery documents. In sum, time, money, and technology are inextricably linked. So, consider putting together a “technology team” at your law firm—to keep apprised of developments in the field of legal gadgetry—one that will ensure your associates are not falling behind or sinking your bottom line.